It’s easy. 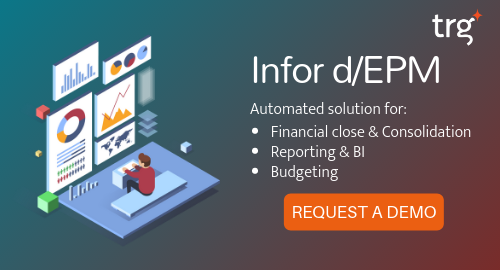 Infor d/EPM is powered by Infor ION, a purpose-built middleware solution that gives you an innovative framework to automate business processes, drive better decision making, and dramatically improve exception management. Infor ION integrates Infor d/EPM with other enterprise applications in near real-time, providing a singular set of data for analytics and performance management. By using ION to combine your ERP solution with Infor d/EPM, you can collect real-time data from source applications and translate them into business insights delivered through a fully integrated solution suite with a common user interface. This results in a single version of the truth, generated by a software suite pre-built to take advantage of mobile technology and a collaborative cloud architecture. Infor d/EPM is designed to collect and compile budgets and forecast data, with workflow and process support that recognizes the iterative nature of the planning process. These capabilities allow you to accelerate the speed of the budgeting process, while also improving the accuracy of information. Leverage advanced analytics to give your finance team the tools needed for value-added decision support with insight into key areas such as financial consolidation, reporting, budgeting, and forecasting. Support ERP system users with a robust analytical engine that translates data collected from accounts payable, accounts receivable, fixed assets, purchasing, and inventory control systems, giving you valuable insight into the overall health of your organisation. Automate data consolidation for financial close and reporting activities, so you can move away from manual spreadsheet tools that are rife with accuracy, scalability, and audit concerns. Consolidate your data into a single repository that provides enhanced reporting through financial intelligence of underlying metadata, integrated financial statements, creation and management of KPIs, and presentations. Infor d/EPM unlocks volumes of data in your ERP system—including customers, sales, financial, inventory, and vendor information—to provide real-time insights that might otherwise be difficult to uncover. Infor d/EPM enables you to align operational performance with business planning, understand risk, manage uncertainty, and drive business improvement with self-service insights. You get complete visibility across your critical processes, from financials and sales performance to production orders and supply chain—in a flexible system, easily integrated with Infor and non-Infor ERP solutions. From analysing operational and tactical data in dashboards and balanced scorecards, to unlocking the valuable operational data in your ERP system, the insights you gain with Infor d/EPM can help you make more informed decisions across your enterprise. 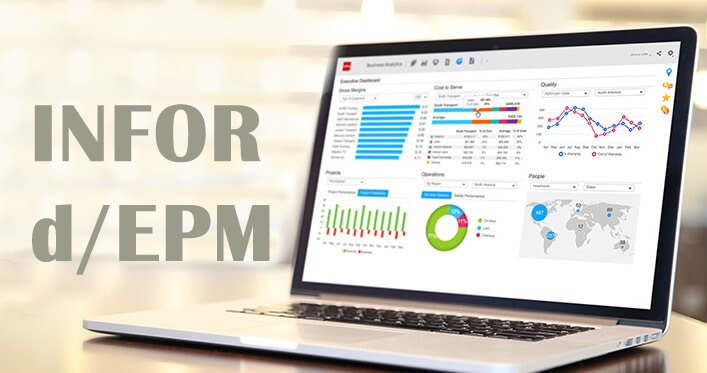 By integrating siloed operational and financial data into a single repository, Infor d/EPM can help you ensure that your business decisions and resource planning functions are based on the most accurate data and reflect the most complete view of your enterprise. Consolidate and connect data sources to yield a single version of the truth. Increase accuracy of resource allocation, management, and planning. Improve the quality and reliability of management information. Increase the accuracy and efficiency of data management and analysis.